For someone who considers themselves a fan of Elizabeth Bear’s work, I sure haven’t talked about her work all that much on this blog. Two of my favorite science fiction novels — Carnival and Dust — were written by Bear, so it should come as no surprised that her latest novel, Karen Memory, would entice me equally as much as her much earlier work. This novel, of course, is not the same kind of thing as Carnival and Dust, both more connected to a long and storied tradition of science fictional writing. 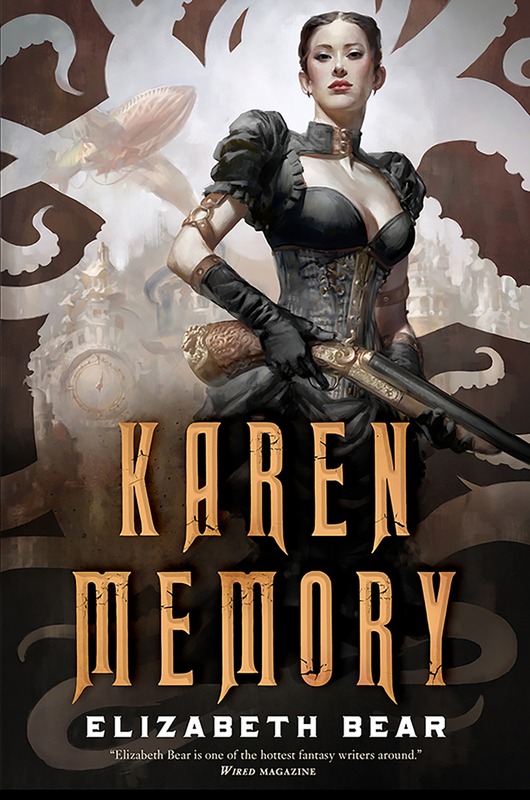 Karen Memory is delicious late 19th-century pulp pastiche steampunk! Karen Memory is set in an alternate history version of the late 19th century where Mad Scientist demonstrations are reported like weather, Singer sewing machines operate like steam-powered mechanical monsters, airships ferry cargo across the oceans, and gold miners inch their way north to the frontiers of Alaska. And in the middle of it all is Rapid City in Washington Territory, a city of many layers where bordellos are almost as common as ladders. In this city lives Karen Memery, a prostitute who works at Madame Damnable’s, an upscale bordello whose clients include some of Rapid City’s finest residents and whose employees are almost like family. All seems well in Rapid — that is until Damnable’s house gets caught up with Peter Bantle after a local activist rescues one of his whores and takes refuge with Damnable’s ladies. Bantle’s whorehouses are run like slave kennels, and Bantle, it turns out, is well known not only for his proclivity for violence, but also for his brutal ambition. When U.S. Marshall Bass Reeves shows up in Rapid looking for a Jack the Ripper-style murderer, it’s soon uncovered the Bantle’s ambitions may extend beyond Madame Damnable’s and the mayorship of Rapid City — they may very well include mind control, destruction, and a threat to the sovereignty of the entire United States. You ain’t gonna like what I have to tell you, but I’m gonna tell you anyway. See, my name is Karen Memery, like “memory” only spelt with an e, and I’m one of the girls what works in the Hôtel Mon Cherie on Amity Streeth. “Hôtel” has the little hate over the o like that. It’s French, so Beatrice tells me. Some call it the Cherry Hotel. But most just say it’s Madame Damnable’s Sewing Circle and have done. So I guess that makes me a seamstress, just like Beatrice and Miss Francina and Pollywog and Effie and all the other girls. I pay my sewing machine tax to the city, which is fifty dollar a week, and they don’t care if your seweing machine’s got a foot treadle, if you take my meaning. In two brief paragraphs, Bear establishes a distinct voice and a historical moment: a moment with socio-political complications and legal loopholes. It’s a moment with its own terminology and implied meanings, and it is also a moment that leaves so much to the reader’s guess work. Though the novel is essentially an adventure story, Bear’s framing of the narrative from the start sets the novel up as one that almost transcends its roots and becomes a political fable, rewriting the Western and the adventure tale — even, perhaps, the scientific romance — as narratives about women (too). Here, the world’s oldest profession, as the saying goes, is front and center, not an implication, not a mere tool of the male gaze, but as a complex tapestry of social, economic, and political concerns. That Karen is the one to tell us about this world is significant, too, as it frames the limitations of the world as the limitations of a specific perspective. Karen is imperfect — sometimes foolhardy, sometimes naive — but also recognizes her world for what it is: hieararchical and broken. However loosely the novel addresses these elements at times, the overall effect is a positive one. There are so many small details that Bear adds to the socio-political moment of her novel, and each time it reminds the reader that this is a narrative that is essentially revisionist in the manner of a reappraisal. It is an endlessly enjoyable affair, too. Bear also makes compelling direct references to 19th century pulp adventure stories, referring to fictional representations within the text and making the text itself a pastiche of the format. Though Karen Memory never becomes a truly pulp tale, as evidenced by Bear’s stylized portrayal of Karen’s voice, its play on the tropes of pulp adventure stories of the period is an enticing sort of indulgence. Karen never lets go of the pulp reference in her account of her adventures in Rapid City and frequently reminds the reader (by name) that she is intentionally telling a pulp adventure story, however “true” her story may be. This referentiality gives the narrative a depth that lifts it from mere adventure. It is a character drama mediated through, as the title would suggest, one individual’s memory. It helps, too, that we’re inclined to love Karen for her blunt honesty and narrative voice, as her references back and forth across literary and story time are always moments of character development. As pastiche, however, Karen Memory clearly doesn’t adhere to the formula, except insofar as the main plot points feel like the kind of larger-than-life expansive adventures one might expect of a scientific romance. The narrative moves relatively cleanly between in-depth character study, horse chases and the occasional gun battle or explosion. Karen’s romance with the rescued Priya, for example, becomes one of the mechanisms Bear uses to help us understand Karen’s past and her ambitions beyond the confines of Madame Damnable’s, as her reflections on her interests in Priya often shift to reflections about her deceased father or her interest in horses, etc.. That relationship, too, provides additional tension to the overarching narrative, especially when Bantle’s violence invades the perceived safety of Damnable’s business. Though some of the side characters do not get quite the development of Priya and Karen, that is largely because of Karen’s telling — we can only assess what Karen chooses to focus on. It’s a device that I found particularly enjoyable, since the novel never pretends that it can fairly represent its world; it can only represent what Karen sees or thinks about. When the narrative shifts to action, Karen’s voice once more shines through, and it is a wonder how Bear can both have Karen describe running down a street in a giant Singer machine mech-monster and relay her complicated feelings about what she is doing, who she is doing it for, and what it will do to Rapid City or the lives of those around her. Though some might complaint about the novel’s pace — a fair concern in parts of the novel — I think that ultimately Karen Memory is storytelling at its finest. Lastly, I must commend Bear not just for giving voice to Karen Memery, a fictional character who might very well have existed, but also for giving Bass Reeves, a very real person, a place in her alternate history. Though Reeves plays second fiddle to Memery — not in a bad way, mind — I think his portrayal lends credence to the idea that Morgan Freeman must be cast in a movie version of Reeves’ life ASAP. I knew nothing about Reeves until I read this book, and so the fact that a piece of steampunk writing could convince me to spend hours of my life Googling information about a real person seems a good enough reason to recommend Karen Memory. As is clear by this point, I’m in love with this novel. It is both a rip-roaring fun adventure and a fascinating exploration of traditionally marginalized characters. If this isn’t a reminder of Bear’s expertise as a wordsmith, I sure as hell don’t know what is. Because Karen Memory is damn good. Beautiful even. It’s a treasure trove of all the things I love about science fiction and fantasy. For that reason, I will continue to read everything Elizabeth Bear puts out that could be called a book.